Note to self: Never leave home without a spare AA. 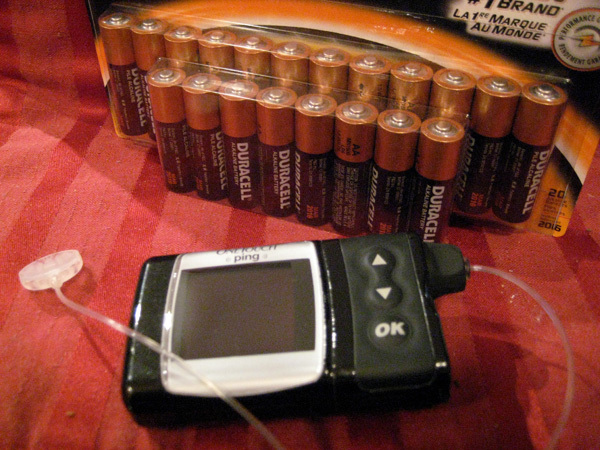 Today I discovered, that not only do I have to remember to have enough test strips in my purse, and sugar tablets in my purse, and backup insulin when I leave the house, I also have to have a fully juiced up AA battery. So yesterday morning, when I was at an interview, the alarm bells on my pump went off, and I had no idea what the heck it was, I thought it was someone’s annoying cell phone ring tone, you know, the chiming sing song kind of ring tone. And it wasn’t until I got in my car, and felt my pump vibrating against my waist along with the chiming bells that I realized, oh, the battery’s low. But I figured it would have enough juice to get me to Saturday morning when I had to change my infusion (it’s quite the hassle to change the battery in the pump, when you’ve still got a sufficient amount of insulin in it, because the pump loses memory when the battery pops out, and even though there’s still insulin in it, it doesn’t read the insulin, so you’re forced to go through all the steps again before it will continue to deliver insulin: rewind the pump, load the insulin cartridge, prime the canula, fill the canula, ugh!) So, I held out. But apparently, as I discovered this morning, I was so wrong on how much juice was left in that battery. Let me back up a little bit here. I took the day off today, and the plan was to go cycling in the Valley with Mario. But when we got up, the skies were grey, and the forecast wasn’t giving us much hope for later in the day. So after a great amount of waffling, we finally decided to take the Skytrain into the city, head to Granville Island for lunch, and then catch a movie at the Fifth Avenue or Tinseltown (which we didn’t end up getting to because the Skytrain broke, and had us stranded inside for a half an hour. Ick). So anyway, we walked to the Skytrain station, about a 10 minute walk from the condo, and just after we bought our tickets, I heard the alarm bell sing song again, and I looked down, and ohmygawd! No delivery, said the message on the screen, change battery. Crap-Crap-Crap! I started rummaging through my purse, hoping, praying that there would be a random battery inside, but not really having much hope, I mean, seriously, who carries batteries in their purses? I DO! Yep, there was a battery, not a clue why, but my gawd, I was pretty darn happy – and relieved – to find one in there. And the second I got home, I stuck another one in to replace that one! Life is all about backup! Even though we didn’t ride today, we did walk 3 km from the Main Street Skytrain station to Granville Island, which is such an amazingly, beautiful walk, with False Creek on one side of us, and the Olympic Village on the other, and a fresh ecosystem, and neat little bridges, and a modern skyline of towers, and runners and cyclists and walkers – and yes, the sun too. It came out! And I had the most amazing sandwich EVER at Granville Island (I love the sandwiches there, and was actually getting excited watching the guy make it) and then we had the yummiest strawberry tarts … hmmm … and breakthrough: I figured out the carb ratio all on my own (no heavy Calorie King book stuffed in my purse, oh no) and had no ups or downs in the blood sugars! Yay! 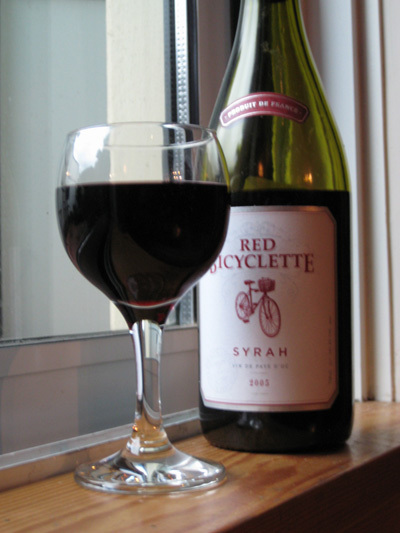 And when we got home, we topped the day off with a bottle of Red Bicyclette! I liked it after about the first half glass. Such a beautiful, refreshing, rewarding day!